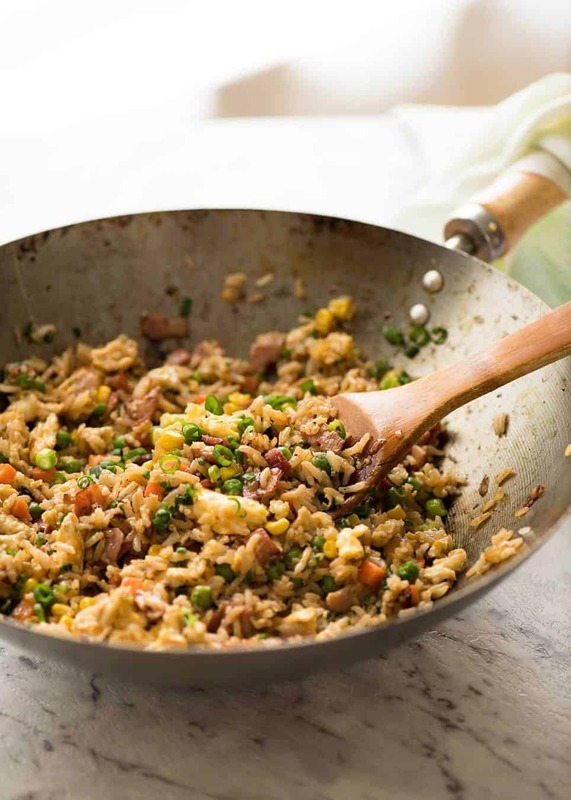 Get the sauce right and you can make a fried rice that really stacks up to your favourite Chinese restaurant in 10 minutes! 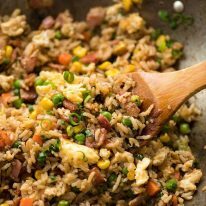 This fried rice recipe is super quick, made with egg and frozen veggies, but I couldn’t resist adding a handful of bacon. A highly versatile egg fried rice recipe you can make your own – such as adding chicken or shrimp/prawns. Serve this as a side with all your favourite Chinese and Asian foods, from Kung Pao Chicken to Beef and Broccoli, Cashew Chicken to Potstickers! 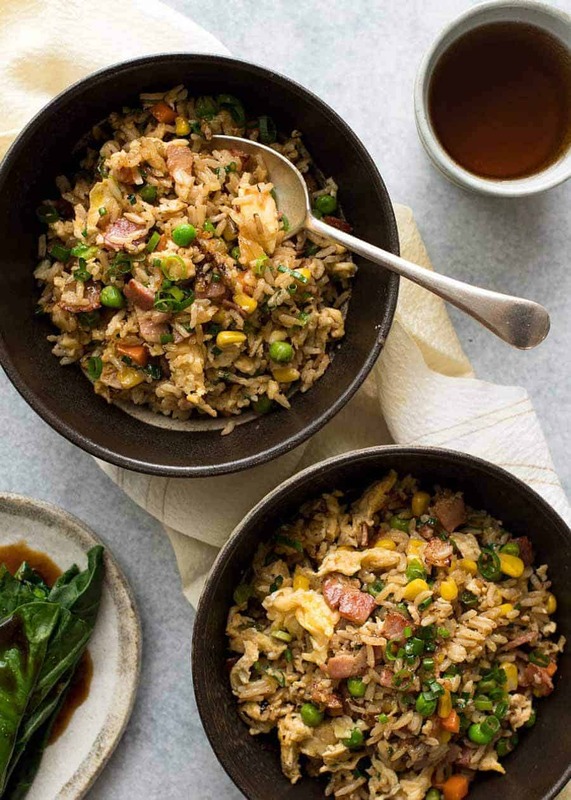 This is a quick, 15 minute fried rice that’s highly versatile. Terrific as it is, but totally adaptable to add what you want. 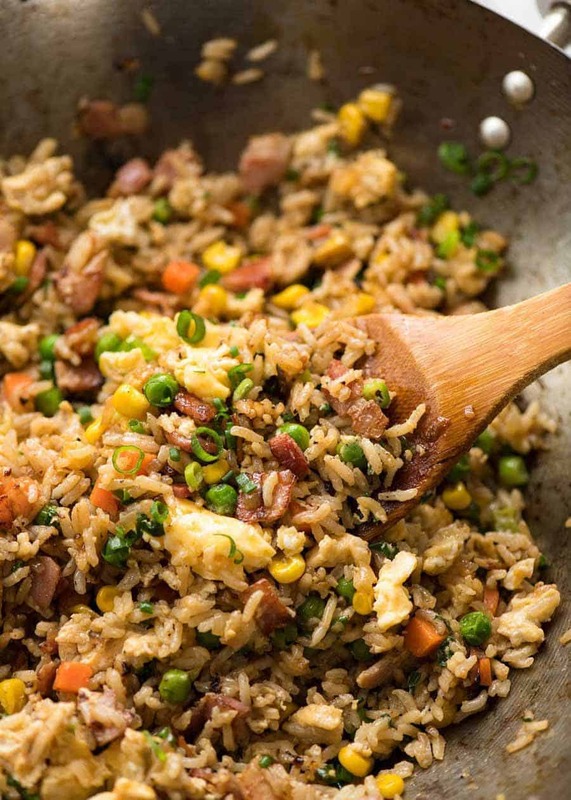 I’ve used egg and a basic mix of frozen chopped vegetables in this fried rice recipe – because I totally buy into the whole “snap frozen” thing. Just carrots, peas and corn (still frozen, don’t even need to thaw). But don’t let my laziness influence you! Feel free to use fresh veggies – whatever you want. Try adding proteins like chicken, shrimp/prawns, tofu. Because here’s the thing about fried rice: when you get the sauce right, you can put anything into it – and indeed, the Chinese do! This Fried Rice recipe is a classic side for all your favourite Chinese dishes! Move everything to the side and scramble egg in the wok or pan. 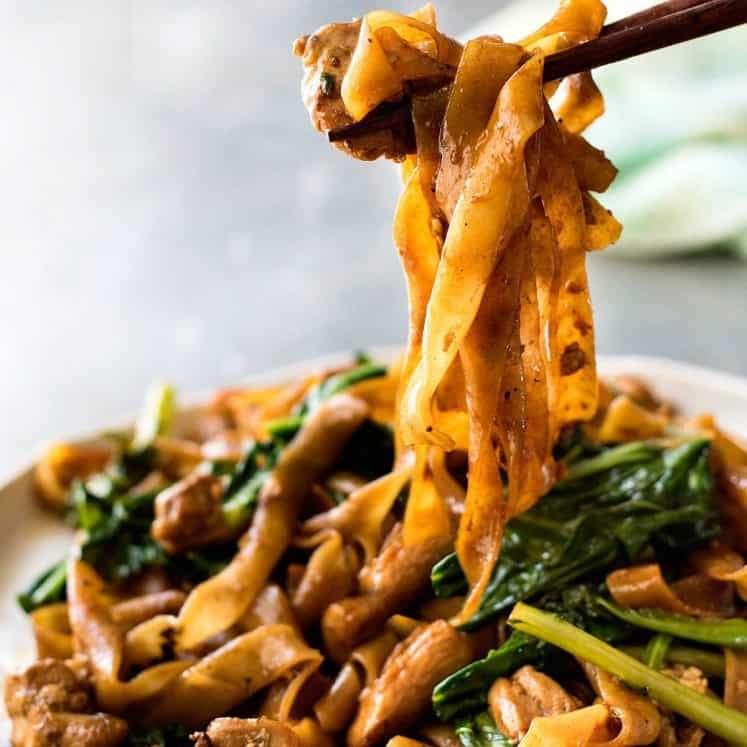 It sounds cheeky, but actually, this is a technique common in Thai Stir Fries, like in the ever popular Pad See Ew. It works great! Add green onion and toss it all together, then serve immediately! Chinese cooking wine or Mirin (secret ingredient!) 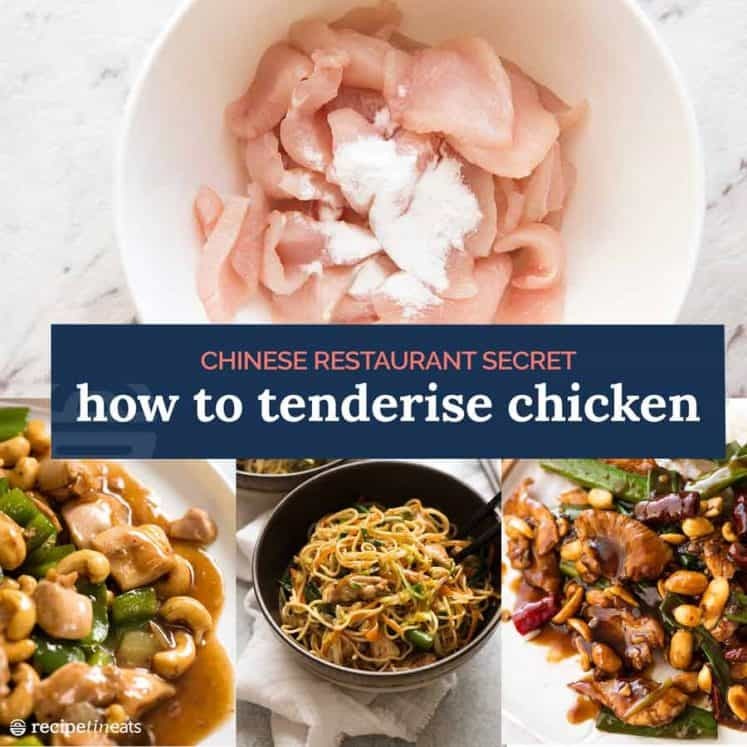 – this is the secret to a really great fried rice that truly stacks up to your favourite Chinese restaurant. If you omit these, it will not taste like real Chinese takeout, however, see recipe for the best non-alcoholic subs. Chinese fried rice is made with white long grain rice. But it can be made with any type of cooked, chilled rice – long grain, short grain, jasmine, basmati, even brown rice. Every Asian country has their version of fried rice, and use different rices. For example, Jasmine rice is used to make Thai Fried Rice. The Japanese use short grain white rice for Japanese Fried Rice. And Basmati Rice is used in Indian rice dishes, such as Biryani. Why does the rice have to be cold or day old? The rice needs to be cold, day old rice because the rice dries out in the fridge so the Fried Rice will have the right texture. Freshly cooked rice is too wet so it makes the Fried Rice clump together. But it’s still tasty – so don’t not make fried rice just because you don’t have time to chill the rice! Do I have to use a wok? Nope. A skillet will work just fine – just make sure it’s a big one so you can toss the rice around without it flying everywhere (the shape of woks is designed especially for wild tossing!). Fried Rice is so good, I’d happily scoff down an entire bowl of it as a meal. But let’s face it, it’s not the most well rounded meal. Stir Fry favourites such as Kung Pao Chicken, Beef and Broccoli, Cashew Chicken and Chop Suey Chicken Stir Fry. Make a meal out of dishes ordinarily served as starters by adding a side of Fried Rice. Things such Hot and Sour Soup, Chinese Corn Soup, Spring Rolls, Chinese Lettuce Wraps (San Choy Bau) or Egg Foo Young. Indulge in a homemade Yum Cha (Dim Sum) style banquet with dishes such as Potstickers, Char Siu (Chinese BBQ Pork), Chinese Steamed Pork Buns, or Crispy Chinese Pork Belly with a side of Chinese Broccoli with Oyster Sauce. Recipe video above. 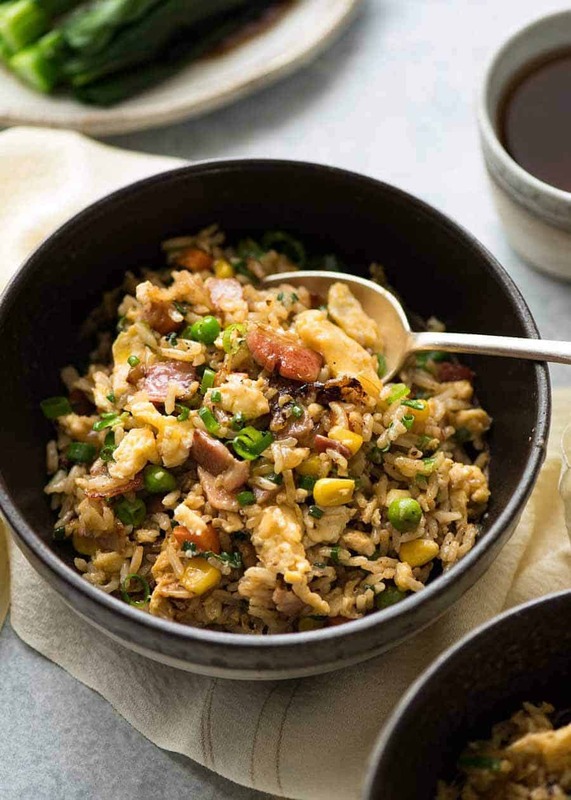 Fried rice is a side that goes with all Chinese and Asian foods! This one truly stacks up to your favourite Chinese restaurant. See notes for scaling recipe up and using skillet instead of wok, and for GF option. Heat about 1 1/2 tbsp oil in a wok or 2 tbsp oil in a skillet over high heat until smoking. Add onion, garlic and bacon. Cook until bacon is light golden - about 1 1/2 minutes. Add vegetables (still frozen is fine). Cook for 2 minutes so they defrost and water evaporates. Add rice and Sauce ingredients. Cook for 1 1/2 minutes until liquid evaporates. Shove rice to the side of the wok / skillet. Add 1/2 tbsp oil into the cleared space, shift wok so the heat is centred over the cleared space. 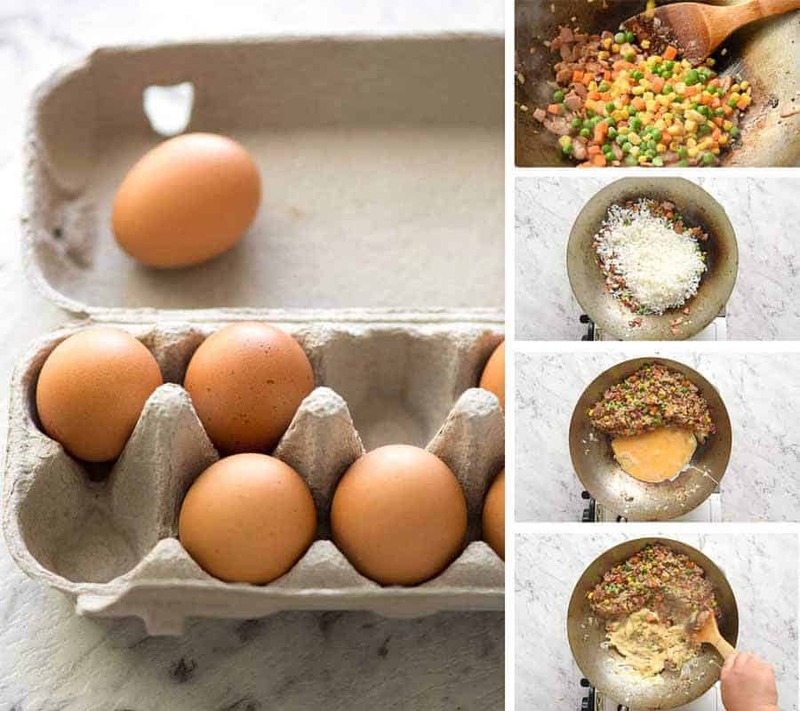 Pour in egg then scramble - cook it through properly, don't "soft scramble". Add shallots then stir the egg into the rice. Remove from heat and serve immediately! 1. Cold, day old rice - You need day old rice that's been refrigerated or frozen (then thawed) because the rice grains dry out, making them ideal for fried rice. Sticky freshly cooked rice is no good for fried rice - it makes fried rice gluey. Long grain white rice is best for Chinese fried rice. But any cooked, cold rice will be fine - white or brown. 2. Here is how I cook white rice: Place 1 cup rice in a saucepan with 1 1/2 cups water over medium high heat. Put lid on, then when the water starts to simmer, immediately turn down to low or medium low so the water simmers gently. Leave for 12 minutes or until water is absorbed into rice (tilt saucepan to check). Do not stir or remove lid during cook time. Remove from stove but leave lid on, leave for 10 minutes. Fluff with fork. Refrigerate or freeze (for use in fried rice). If it's an emergency, cook the rice per above, spread on a tray and refrigerate until cold, then proceed with recipe. 3. Chinese cooking wine or Mirin (or cooking sake or dry sherry) is an essential ingredient for making a truly "restaurant standard" fried rice. Though many recipes suggest using liquid chicken broth, please do not do this - it makes your fried rice wet and gluey! 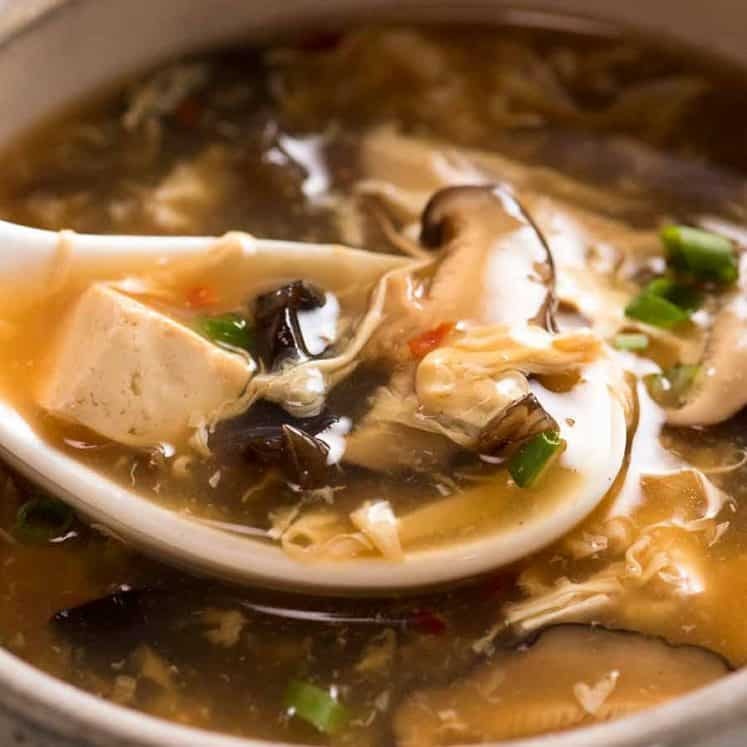 If you can't consume alcohol, adjust recipe as follows: Reduce oyster and soy sauce to 2 tsp each, and add 1 tbsp water to the Sauce. Proceed with recipe. When you add the rice, add 1/2 tsp chicken or vegetable stock powder (or bouillon cube crumbled). Stir through, then add remaining Sauce ingredients exc the Cooking wine. Proceed with recipe, add tiny sprinkle of salt at end if you want it saltier. 4. Soy sauce - Any soy sauce is fine here (but not sweet or flavoured). I like dark soy because it adds colour. 5. SKILLET: If using a skillet, add about 1/2 tbsp extra oil at the start to compensate for larger cooking surface. Also, if you use a large skillet, you can scale up the recipe by 50% - click on the Servings number and slide the scaler until the rice becomes 3 cups, it will change all the ingredients. Once you add the rice, use 2 wooden spoons to toss it - makes up for not having the high walls of a wok. 6. GLUTEN FREE: Make sure you use gluten free soy sauce and Oyster Sauce if you want to make this gluten free. 7. 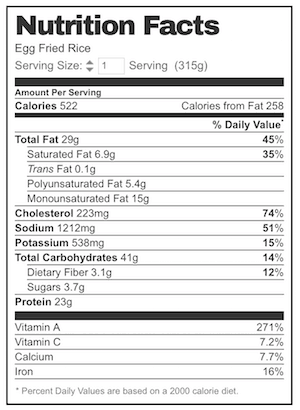 Nutrition per serving, assuming 3 servings. I find that this is sufficient for a meal - and no one has ever accused me of eating like a bird! Originally published March 2018, updated with extra information March 2019 – no change to recipe. I upsized my little 2 seater convertible to a smallish 4WD because he grew out of it and hated the wind in his eyes when we were zooming around with the top down. 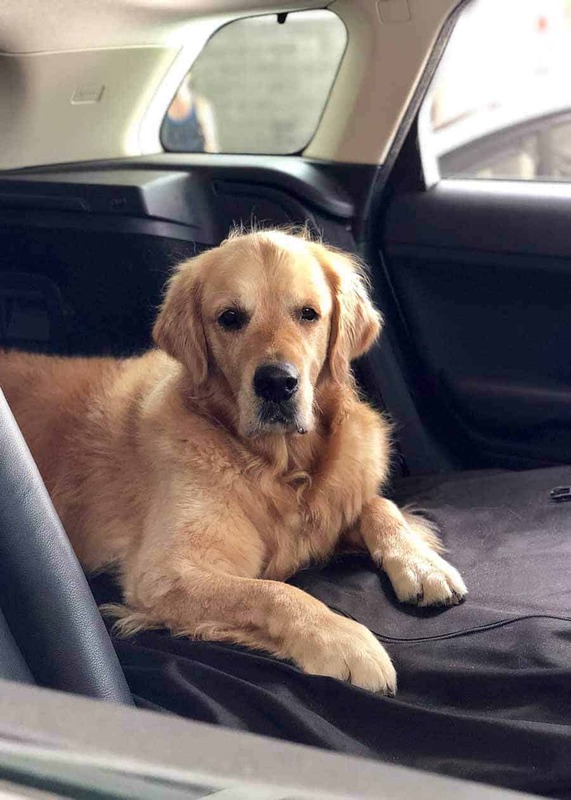 All that for a bloody dog, and yet he was so unhappy shoved in the boot, he’d stand with his chin on the back seat so that drool dripped down the leather seats (sorry to gross you out). I like this fired rice and I want to try this type of recipe in my home. I hope you give it a go and love it! I’m so glad you love it Kylie! Woah that sounds decadent & absolutely delish! The Sang Chow Bow was the best recipe I have ever used. Made this now for lunch. Had it together with your wonton soup . Added leftover sweet corn kernels and used luncheon meat instead of bacon (bacon’s so expensive here ). My parents think lunch was great ! Maybe can add dried fish flakes next time . I love your site so much ! Wish I can send you photos of my finished product hehe ! It went great. Had a lot of fun making it and at the end it turns out to be delicious! I just like to thank you . I have tried several of your recipes. I thought the ones I had were great, but your recipes take it the next level. Everyone loves them, and have asked what I have done differently. That’s wonderful to hear Despina, thanks so much for the great feedback! Just had this for dinner, first time trying to make fried rice and I’m absolutely astoundsed that I’ve never tried before. Amazing! I did used fresh cooked rice, and no bacon, but it was still awesome and looking forward to trying again. Made a double batch for lunches tomorrow but hubby already ate his lol. I only realised after I had already started prepping that it needs day old rice, any tips for using fresh cooked rice? This is an AMAZING dish which I make often. Good work Nagi! The last time I made it I added some Sriracha before serving and it took it to another level! Have Made a handful of times, always good! Great with Chinese sausage. Yes! I love Chinese Sausage! Wahoo – so great to hear! Made this, with leftover Christmas ham & plenty of extra veggies. Had to double the sauce and it was fantastic! Next time I may use frozen veggies too, to save time, though. I’ve already made several recipes, including this one, and they were all delicious. It’s become my go-to source for reliable recipes! Your notes are so meticulous and helpful. I wanted to see how quick and easy this was to make. The flavors are wonderful and I just loved it. Will make it again for my friends. Just making this for the 4th time. Its fab. My hubby says he could eat it every day. But you have so many great recipes that’s not going to happen.